What do you mean you haven’t got a copy of the debut solo album from Odetta? For shame, because everyone’s home should have a copy of the defining folk record that is Sings Ballads And Blues, which came out way back in 1956. Here it’s coupled with her 1960 live album At Carnegie Hall, so that’s twenty eight tracks, albeit shorn of the bonus tracks on the earlier reissues. Widely revered in folk circles, Joan Baez said “Odetta was a goddess. Her passion moved me. I learned everything she sang.” Bob Dylan added “The first thing that turned me on to folk singing was Odetta. 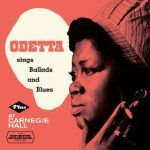 Right then and there, I went out and traded my electric guitar and amplifier for an acoustical guitar… I learned all the songs on that record.” All of which takes away from the fact that Odetta could not sing. Well, she could, but only in the manner that a walrus belches. However, if you ever wanted to hear Leadbelly songs disembowelled and their guts laid out to dry, then this is the place to come. It’s a place where the Emperor’s New Clothes are writ large, and an Aprils Fool joke gone wrong comes home to roost. An album with no redeeming features whatsoever is a rarity, but this embarrassment of fool’s gold is one of them.